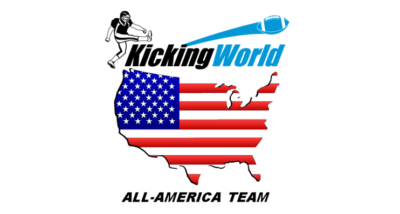 Kicking World.com is conducting a national kicking combine, specifically designed for advanced High School football kickers who want to be college kickers. Kicking World.com is conducting a national kicking combine, specifically designed for advanced High School football kickers who want to be college kickers. Please visit www.kickingworld.com or call 512-817-1333 for detailed information! PRLog (Press Release) – Mar 26, 2008 – Kicking World (www.kickingworld.com) conducts football kicking camps specifically designed for advanced kickers and punters to help teach them accelerated kicking techniques, form, strength coaching, accuracy/distance improvement, and mental toughness to become clutch kickers in any pressure situation. We work with advanced kickers to help them get Division 1 Scholarships through exposure, recruitment-process coaching, and higher-level training to gain the necessary tools to become an elite kicker in college or professionally. The upcoming spring kicking camps are going to be held in Irvine (Orange County) California on Sunday, April 20, 2008, and Sunday, June 1, 2008 from 12:00pm-2:30pm. We draw football kickers and punters from various states across the country. The upcoming performance kicking camps will also feature a guest speaker, former NFL Scout, who will discuss the college recruitment process, scholarship details, and how to get signed professionally. We will cover all the steps necessary to keep you in compliance with the NCAA guidelines so that you work smart, market yourself appropriately, and get yourself noticed! · Kicking Competitions for prizes & exposure!